Lauren Bacall was born on September 16, 1924 in New York City, New York. She died on August 12, 2014 at age 89. After working as a model in her early twenties, Bacall debuted with husband-to-be Humphrey Bogart in TO HAVE AND HAVE NOT. The two were married in May 1945 and were together until Bogart's death in 1957. After Bogart's passing, Bacall went on to marry Jason Robards in 1961. They were together for eight years until their divorce in 1969. Lauren's nickname has long since been "Baby". But her trademark sultry voice seems contradictory to her innocent persona. Nevertheless, Bacall has been tempting men around the globe for ages after TO HAVE AND HAVE NOT penned Bacall as "the seductress" thanks to her line to Bogart: "If you want anything, just whistle. You know how to whistle, don't you Steve? Just put your lips together and blow." 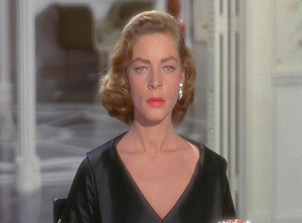 Bacall's notable films include: THE BIG SLEEP, KEY LARGO, DARK PASSAGE, and HARPER.